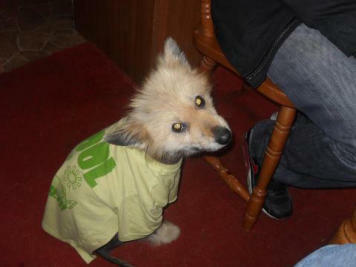 Stichting Saartje, honden met hypofysaire dwerggroei. ‘Pituitary Dwarfism, a bigger problem than expected ‘ is de title van mijn boek over deze erfelijke afwijking die voorkomt bij Duitse Herdershonden, Saarlooswolfhonden, Tsjechoslowaakse Wolfhonden, Witte Herdershonden en de Karelische Berenhond. Honden met deze afwijking hebben een tekort aan de Hypofyse Hormonen GH, TSH, LH en FSH en lijden daardoor aan allerlei kwalen en kwaaltjes. Naar schatting overlijdt ca 90% van de aangetaste pups rond de geboorte. Bij de 10% overlevende pups is de grote groeiachterstand het meest opvallend, maar nier/leverfalen, kaalheid, huidproblemen, traag werkende schildklier, en deformatie/instabiliteit van de bovenste nekwervel zijn vele malen ernstiger en maken dat de meeste dwerghonden niet ouder worden dan ca 4 jaar. Ivm de plannen voor ons wooninitiatief moet ik helaas mijn werk voor Stichting Saartje tijdelijk op een laag pitje zetten. Onze ambassadeur in Engeland, Stephen Webb, neemt mijn werk grotendeels over. Uiteraard blijf ik wel meedenken, adviseren, en vragen beantwoorden ! Stephen heeft een zeer informatieve website gemaakt: http://gsdpituitarydwarfism.weebly.com/ Onderaan deze pagina vindt u meer foto`s van honden met hypofysaire dwerggroei. Pituitary dwarfism in German shepherd dogs -Availability of a genetic test- Annemarie Voorbij and Hans Kooistra Department of Clinical Sciences of Companion Animals Faculty of Veterinary Medicine, Utrecht University Utrecht, The Netherlands The pituitary is a hormone producing gland at the base of the brain. This pea-sized gland is composed of three parts: the anterior pituitary, the intermediate lobe and the posterior pituitary. The anterior pituitary synthesizes and secretes six hormones, which are essential for numerous body functions, such as growth, reproduction, lactation, metabolism and handling stress. These 6 hormones are: ྷ Growth hormone (GH), which is essential for growth ྷ Thyroid stimulating hormone (TSH), which regulates thyroid function ྷ Prolactin (PRL), which is essential for lactation ྷ Follicle stimulating hormone (FSH) and Luteinizing hormone (LH), which are essential for ovulation in female animals and sperm production in male animals ྷ Adrenocorticotroph hormone (ACTH), which stimulates the adrenal cortex Any defect in the development of the pituitary gland may result in a form of isolated or combined pituitary hormone deficiency. In dogs, congenital GH deficiency or pituitary dwarfism is the most striking example of pituitary hormone deficiency. 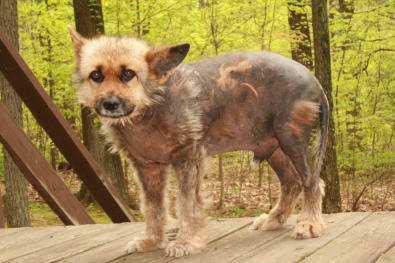 This recessive inherited disorder is encountered most often in German shepherd dogs, but it has, for example, also been reported in Saarloos wolfhounds. The genetic defect causing congenital GH deficiency in German shepherd dogs is also the cause of pituitary dwarfism in Saarloos wolfhounds, because the disorder in the latter breeds was first recognized after German shepherd dogs had been used in the breeding of Saarloos wolfhounds. German shepherd dwarfs have a combined deficiency of GH, TSH, PRL, and the gonadotropins. In contrast, ACTH secretion is preserved in these animals. Dogs that are carriers of the mutated gene that causes pituitary dwarfism do not have any symptoms and look exactly the same as their fellow German shepherd dogs that aren’t carriers. Since pituitary dwarfism is a recessive disorder of a single gene, the birth of a dwarf indicates that both parents are carriers of the mutation. 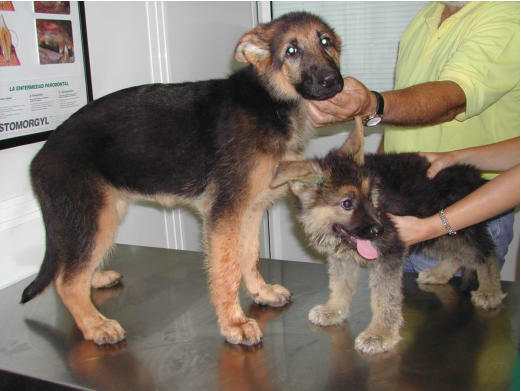 In Figure 1, two German shepherd dogs from the same litter are depicted. The dog on the right is clearly a dwarf. Although the dwarf is significantly smaller than his healthy littermate, the dog is in proportion. Another clinical manifestation of pituitary dwarfism that can be seen in this picture is that the dwarf has retained his puppy hair coat. In time, the hair coat will be largely lost and the animal will become alopecic (bold) (Figure 2). The growth retardation and the abnormal hair coat are mostly noticed by 2 to 3 months of age. The hairs are easily epilated, and when the animal loses its hair coat, the skin can become squameous and hyperpigmented, making the skin darker in color. Furthermore, due to a lowered local immunity of the skin, dwarfs are prone to bacterial skin infections. However, the clinical signs are not limited to exterior appearances. The dwarfs suffer from a whole range of clinical manifestations far worse than skin and hair coat problems. For instance, GH deficiency also leads to underdevelopment of the kidneys, causing chronic renal failure. The deficiency of TSH will result in an underactive thyroid gland, causing the animals to be slow and dull. Furthermore, the insufficiency of the gonadotropins will result in failure of one or both testis to move, or "descend" into the scrotum (cryptorchidism) in male dwarfs. Female dwarfs do go into heat, but they do not ovulate. It can be concluded that pituitary dwarfism is a serious disorder. Although the physical features of pituitary dwarfism may seem obvious, the final diagnosis should be based on 'pituitary stimulation tests'. These tests can detect a deficiency of GH, TSH, prolactin, LH and FSH. The most logical therapeutic option would be to treat the dwarfs with canine GH and thyroid hormone. Treating the animal with thyroid hormone is simple, but it is not possible to treat the dwarfs with canine GH, since it is not available for therapeutic use. However, research has demonstrated that porcine GH is identical to canine GH, making it a good alternative for treatment. Without proper treatment, the long term prognosis is poor. Many dwarfs will not live more than 4 to 5 years. However, some dogs do live longer, probably because in some cases the pituitary still produces a small amount of hormones. Although the prognosis improves significantly when dwarfs are properly treated, their prognosis still remains guarded. 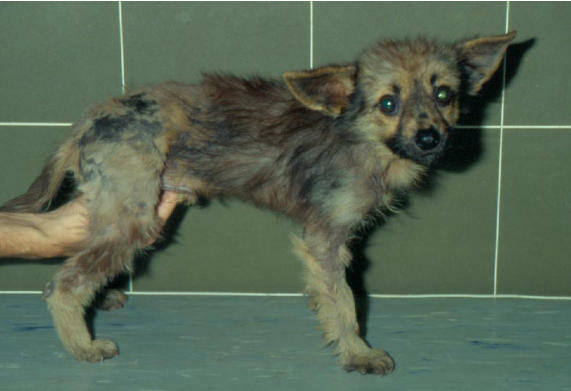 It should be clear that the birth of dogs with this serious illness should be prevented. In order to do so, two carriers of this mutation should not be bred. The problem is that, as mentioned earlier, one cannot distinguish a carrier from a non carrier judged on its appearance. This would require a genetic test. After 15 years of intensive research at the Department of Clinical Sciences of Companion Animals of Utrecht University, this test is now available! If this test would be used for all breeding animals, pituitary dwarfism could be completely eradicated in German shepherd dogs. A genetic test may not seem to be of big importance to German shepherd dogs, since the disorder seems to occur only occasionally. However, one should keep in mind that many dwarfs die in the uterus or shortly after birth. One should also be aware of the fact that if just 1 percent of the German shepherd dog populations are dwarfs, then 18 percent of the population will be carriers of the mutation. This means that the number of carriers will be much higher than might be expected. When 2 of these carriers are mated, on average 25 percent of their offspring will be dwarfs and half of the siblings will be carriers of the mutation. For the genetic test, 4 ml. of blood (collected in an EDTA containing tube) is needed. The blood sample has to be shipped to: Dr. H.S. Kooistra (H.S.Kooistra@uu.nl) Department of Clinical Sciences of Companion Animals Faculty of Veterinary Medicine, Utrecht University Yalelaan 108 3584 CM Utrecht The Netherlands The costs of the genetic screening for the mutation that causes pituitary dwarfism in German shepherd dogs are Euro 100 (excl. VAT). In short, pituitary dwarfism is a serious, incurable illness of which the occurrence is highly underestimated! The good news is that there is now a genetic test with which carriers of the mutation can be identified. If all breeding animals were tested (only once), and a correct breeding policy would be implemented, this severe illness could be completely eradicated. i Figure 1. 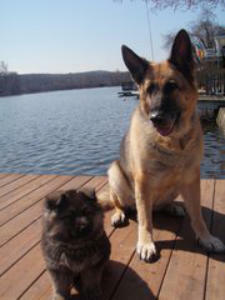 A healthy German shepherd dog (left) and a dwarf litter mate. Figure 2. A 10-month-old German shepherd dwarf with lack of guard hairs and retention of puppy hairs. Shedding light on canine pituitary dwarfism That is the title of the thesis that Annemarie Voorbij had to defend recently in order to receive the title of doctor. I am proud I was given the opportunity to be present at this important day. In 2003 I `bought` a Saarlooswolfdog named Xirtaki Xymphoni de Louba-Tar, at that point unknown of the fact that she was pregnant. On oktober 23th 5 puppies were born. Two of them turned out to be pituitary dwarfs, one of them was Saartje, after who the foundation was named in 2010. In my search to help Saartje, I was advised to consult Dr Kooistra at the Department of Clinical Sciences of Companion Animals, Faculty of Veterinary Medicine, Utrecht University, Utrecht, The Netherlands. He told me that the best treatment for a dwarf would be treatment with porcine Growth Hormone and Thyroxine, but porcine GH was not allowed in most countries including the Netherlands. So I started searching for a way to obtain GH for Saartje, and after 6 months I found Zamira Life Sciences Pty ltd. in Croydon, Australia. This firm still provides the pST (porcine Somatotropin = Growth Hormone) to the Utrecht University. After Saartje died in 2007 I continued to help other owners of dwarf dogs, and when a breeder asked me in 2009 if I wanted the 2 dwarfs that were born in her kennel, I decided it was time to start the Saartje Foundation. The Saartje Foundation`s highest priority is to prevent dwarfs from beeing born by informing breeding clubs, breeders, owners, buyers, and vets about the disorder. Among others our dwarfs helped finding the defected gene that causes pituitary dwarfism. Additionally they helped locating the neurological problems that are often seen in dwarfs. Saartje had severe neurological problems in 2006, but we could not find what was causing it. 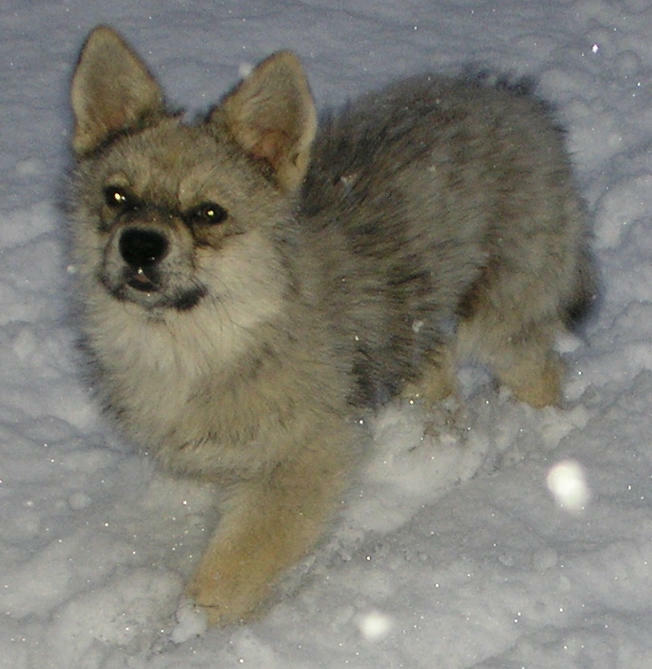 After we took in 3 Czechoslovakian Wolfdogs we were confrontated again with dwarfs that were suffering from neurological disorders. Our Faith died at the age of only 8 months. she turned out to have a serious malformation of the first vertebra, that caused severe pressure on the spinal cord. So we took an MRI of our other dwarfs, and they all turned out to suffer from ` incomplete ossification of the suture lines between the ossification centers of the atlas with concurrent atlanto-axial instability and dynamic compression of the spinal cord. ` Our dwarf Carinoso died 10 months later, also due to severe instability of the neck joint. The thesis of Annemarie Voorbij containes the following conclusions: *Pituitary dwarfism is an autosomal, recessively inherited disorder characterized by underdevelopment of the pituitary and a deficiency of growth hormone, thyrotropin, prolactin and the gonadotropins, but unaffected corticotropin secretion. *A deletion in intron 5 of LHX3 is responsible for pituitary dwarfism in dogs. 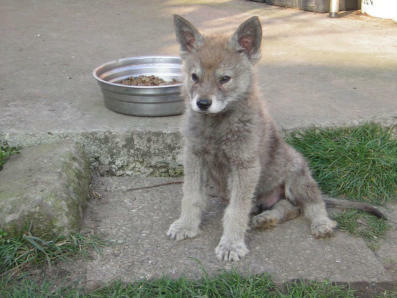 The mutation has been found in the German Shepherd Dog, the Saarloos Wolfdog and the Czechoslovakian Wolfdog. Probably dwarfism in the White Shepherd Dog and the Karelian Beardog is due to the same mutation. 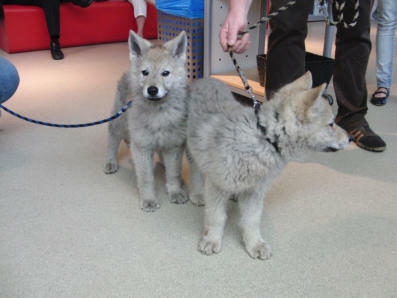 *239 Saarloos Wolfdogs were tested, 31 % turned out to carry the defective gene. 21 % of 200 Czechoslovakian Wolfdogs, and 30% of 44 tested German Shephard Dogs were carrier. Because most affected puppies die before or just after birth, dwarf dogs are not seen as often as one would expect, based on the number of carriers. *Dwarfism causes severe suffering of the dogs, but can easiely be prevented by testing animals that are meant for breeding purposes. The Dutch Law commits breeders to use genetic tests if they help prevent the inheritance of serious deviations, but until now especially the GSD breeding Club refuses to oblige their breeders to use the DNA test for Pituitary Dwarfism. *The incomplete ossification of the first vertebra is expected to be related to the mutation in LHX3. therefore it is important to monitor pituitary dwarfs very closely for any sign of neurological problems. we advise to use a harnas for these dogs instead of a collar. The Saartje Foundation is very lucky to have Ambassadors in England, Australia, USA, and Poland. Our English Ambassador Stephen Webb has made a wonderful website where you can find more information. http://gsdpituitarydwarfism.weebly.com/ With help of Dr Kooistra I wrote a book, informing breeders, owners of dwarf dogs and their vets on what medical problems the dogs can suffer from and what treatment would be available. I hope some day the Saartje Foundation will help to eliminate pituitary dwarfism from the affected breeds completely. 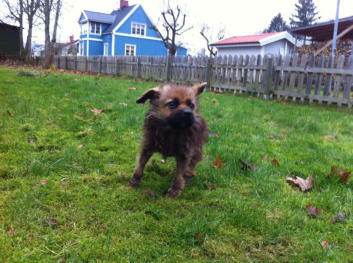 Until that day, we will continue to inform and help the dwarf dogs and their owners ! 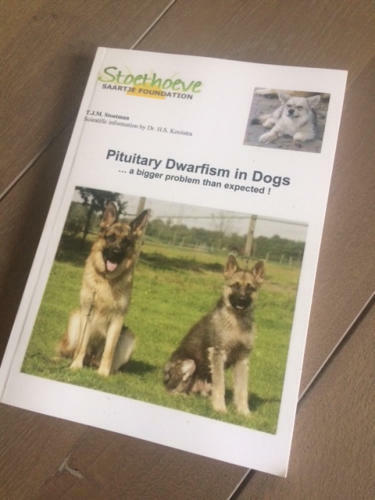 The book about Pituitary dwarfism in dogs can be ordered by sending an Email to Saartje@stoethoeve.nl The book is written in English, and informs about the disorder, why dwarfs are still born today, about all the health issues that may occur and what treatment could help. Costs are € 8,- plus the costs for sending it to you.